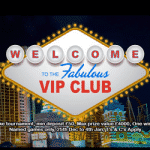 Red Spins casino offers you a one and only chance to finally visit Miami this year, so if that sounds like a great way to spend your free time – then head to casino Red Spins. The following promotion runs between the 4th April and 16th April, which is enough time to get a top spot on the leaderboard. Think about all the things you can do while visiting Miami, most of which would be sponsored by RedSpins, of course. The Hotline package includes return flights for two people, private transport to the airport, a five night stay in a 4* hotel at the south beach, daily breakfast, a speed boat cruise, helicopter tour, plus £1,000 in cash for additional spendings. In order to become eligible for the prizes that have been selected for this occasion, the players must deposit and stake a minimum amount of £50, on games that are featured during this promotion. The offer is available to valid account holders, aged 18 and older, who qualify for the RedSpins bonus program. You can find the full terms and conditions alongside the rest of details that are provided with this particular offer, and learn how to efficiently enter the competition and win yourself a trip to Miami.